Johnson's Brazil Argentine Republic, Paraguay and Uruguay. 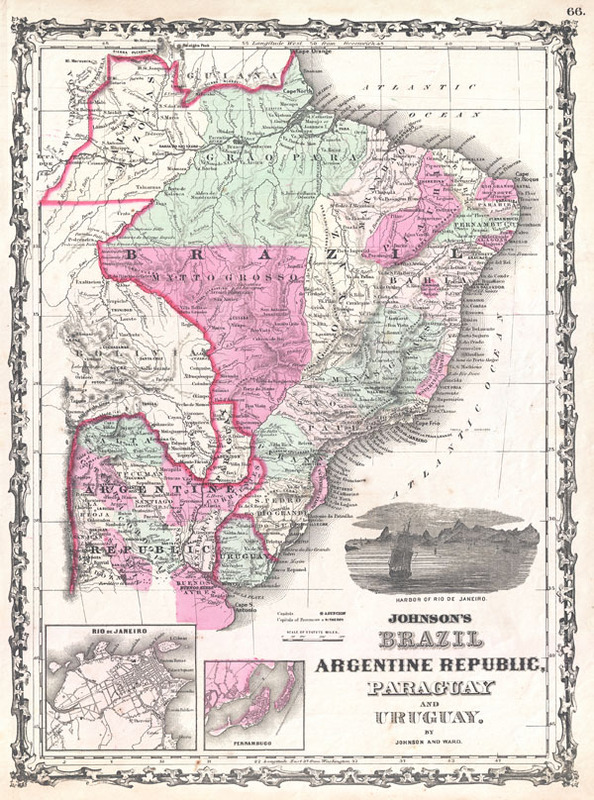 A very attractive example of Johnson's 1862 map of Brazil, the Argentine Republic (northern Argentina), Paraguay and Uruguay. Offers excellent detail both along the coast and inland, especially along navigable rivers. Shows most of Bolivia as well, through the border between Bolivia and Brazil was at the time unsurveyed and largely speculative. Shows the Diamond Region in Bahia, just west of San Salvador. Also notes Iguazu Falls in Argentina (Falls of Iquedas). The Amazon region is unsurprisingly vague though a few river ways and missionary stations are noted. Inset maps in the lower left quadrant detail Rio de Janeiro and Pernambuco. An engraved view in the lower right quadrant dhows a sailing ship entering the Harbor of Rio de Janeiro. Features the strapwork style border common to Johnson's atlas work from 1860 to 1863. Published by A. J. Johnson and Ward as plate number 66 in the 1862 edition of Johnson's New Illustrated Family Atlas. This is the first edition of the Family Atlas to bear the Johnson and Ward imprint. Rumsey 2905.037 (1860 edition). Phillips (Atlases) 6140-55.